Drip Series is the process of automatically sending emails on a scheduled basis. Email templates are created and sent out in a series at user defined intervals. This is a great tool for prospecting/campaigning to an existing customer base. It can also be used to stay in touch with your customers at regular intervals. Create the series of emails you want to send out at scheduled intervals using merges to display customer specific information. You can do this under Marketing > Email Templates. 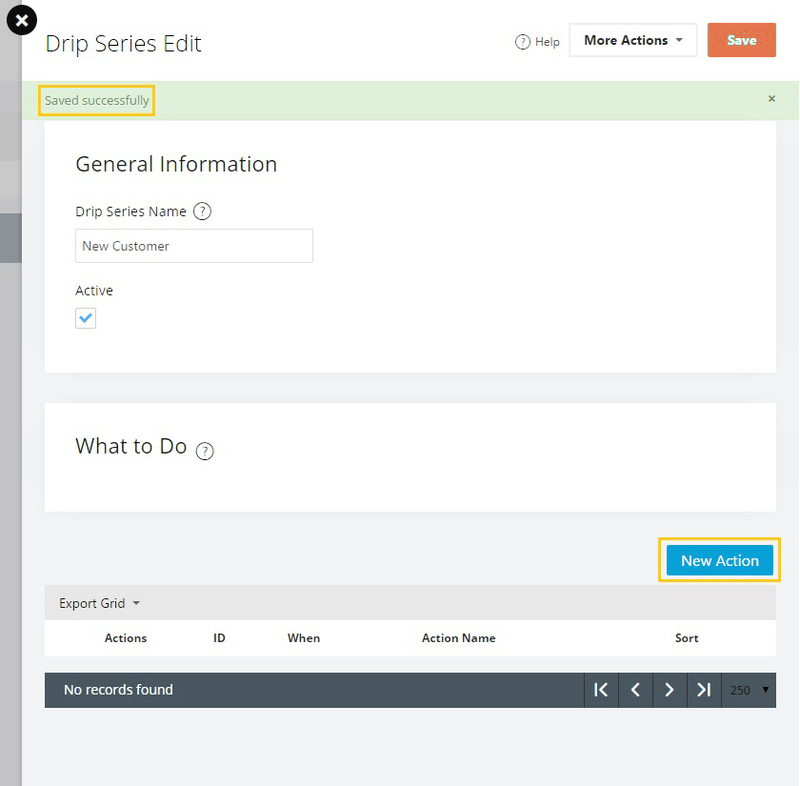 Click the New Button in the top right to create a new Drip Series. Drip Series Name: Name the Drip Series and mark as Active when you are ready to make this series Active. The name is shown in dropdowns and settings screen throughout the application. Active flag turns this drip on and off. If inactive, this drip series will not process automatically. Click the Save Button after naming the Drip Series. After saving, click New Action. Step Name: The name of the action for quick reference. There is no real logic associated to this, it is here for understanding at a glance. When to do this: Tell the scheduler when to perform the action and at what time interval(s). A minimum time interval of 15 minutes is required between two steps. Note: If you have a RecurringUntilNextStep setup as the last option, this will send the email at the timed interval without stopping. We recommend you have a last step setup with an AfterSeriesStart as your last email. This is to avoid sending emails repeatedly without an end date. Email Template: The selected email template to send in case of an AutoSentEmail. This template and it's settings will be used for the selected step. Sort Order: Sort order of this action. IMPORTANT: Please keep these in the proper sort order. Keep them in order of when they will logically be happening. 30 minutes AfterSeriesStart should be sorted BEFORE 24 hours AfterSeriesStart, etc. This cannot be automatically done because RecurringSteps have no logical placement without the user defining it. Click the Save button to save this step. Repeat the above steps to create more Drip Series Steps. You can create as many steps as you need. Creating the Drip Series Steps completes the step of defining the steps to use for the Drip Series Campaign. Click the people Icon for the drip series you wish to add a customer to. Type in the name of the customer you wish to add. Select the correct customer record from the drop down box. Selected customer is automatically added to the list. Note: You can send the Drip Series to your existing customer list only. If you need to send the Drip Series to someone not on the list, add them it under People > Customers > New. You can also add a single or group of customers to a drip series in the Customer list under People > Customers. Filter customers if necessary to get a manageable list to select customers from. Check the check box for applicable customers from customer list. Select the desired drip series from the list of active drip series. You can now make the Drip Series Active by checking the Active checkbox and save. Start the campaign. Or run a manual test by using the Process Now button under the "Action" tab. The Process Now button will process the drip series. On big series this will take a while. Once started manually, this will automatically call the system periodically for the following steps. This is here to test your settings and manually start a drip. Testing Hint: If you delete emails from a customer's email log, they will then be scheduled again for any previous steps that got deleted. I know there is a way to associate a drip series with a product order, but this instruction set doesn't explain that...seems like it would be the most common use case. Once you have your drip series setup you then need to establish a rule to trigger the drip series for that product when ordered. To do this, go to Tools > Rule Engine > Order Events. Then "new". Give it a name, make it active and check the checkbox that says "A new order is placed or created". Then save. Once you save it, that rule then gives you the conditional options to complete the creation of the rule / trigger. You want it to "Match All of the following"
The Action type would be "Add customer to drip series" then you select the drip series you setup for that particular product. I envision using drip emails to reach customers with coupons X days after they place an order. My question is whether I can make drips start-over when a new order is received rather than completing a chain. For example, if I set up a drip to send a coupon at 30 days, 45 days and 60 days and a customer orders at 25 days can that action reset the timer so they don't receive the coupons based on the first order? Does the action "Add customer to drip series" start the drip series for that customer? If you set it up so a customer gets an order follow up email 8 days after their order ships, do you have to manually start the drip, or does the order action start it? So as you get orders, it starts the process for each order? 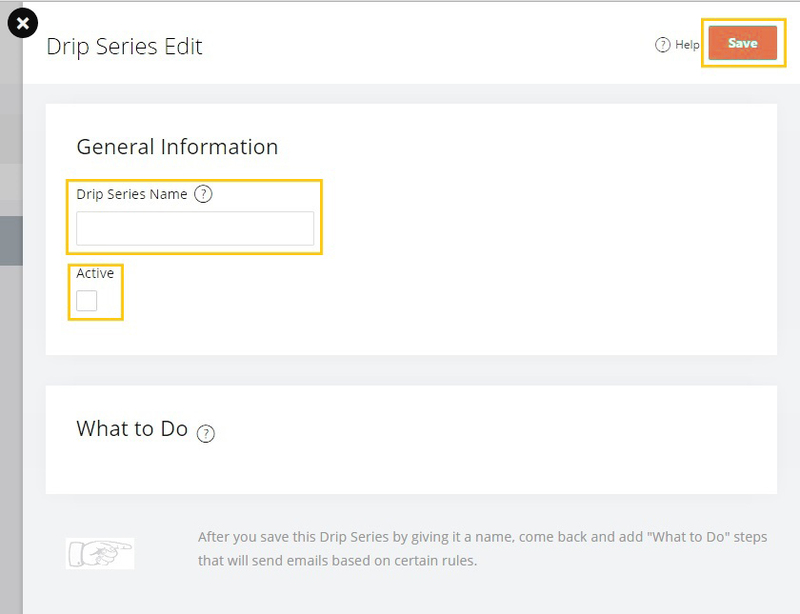 Can the drip series email be sent to individual customer accounts that are grouped together in the same company? I tested this out and the drip series email was only sent to the parent company.